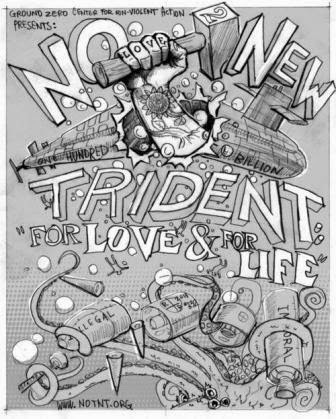 There is a move afoot to establish the Trident nuclear weapons system as the sole nuclear weapons system for the United States (see article that follows). We currently have a nuclear triad - submarines, land-based missiles and bombers - that has been in place for decades. Backers of the proposed nuclear "monad" say that the move would not only cost less, but that it would provide an adequate nuclear deterrent into the future. And once again, as in every discussion of the future of US nuclear weapons, the key word is "deterrence." No one (in these conversations) is questioning the validity of deterrence in the new world order that seems so obvious to most nations except our own. 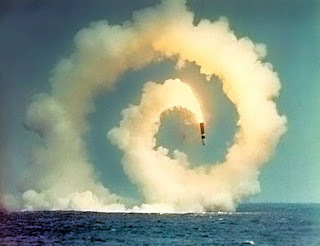 No one is stating the obvious (and probable reasoning behind such a push) - that the nation's ballistic missile submarine fleet is the greatest symbol of the projection of force around the globe by the United States. We should, however, be asking, "Just how far will that force project before it is finally checked." Not a comforting thought when you're dealing with nuclear weapons. Rather than spending $100 billion just to build twelve new Tridents, might we put that money into human needs? 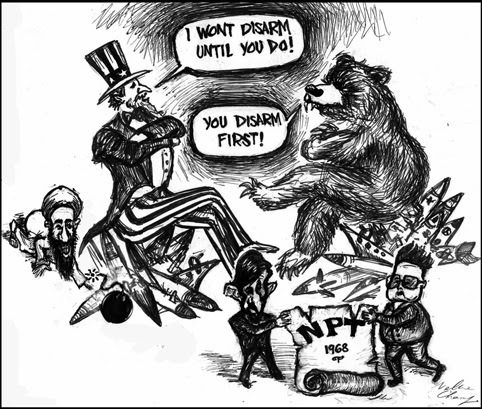 And might we begin a sincere effort, in conjunction with the Russians, to lead the world toward disarmament? This is no naivete... this is about the survival of humankind. With all the talk of full speed ahead with a new nuclear weapons system based on an outdated doctrine ( of deterrence) and originally designed specifically as a massive counter threat to the Soviet Union based on the unthinkable (large-scale nuclear war), perhaps this is the time to step back and rephrase the conversation to ask some questions, such as - "Just what security will this nuclear weapons system create?" ST. MARYS, Ga. (AP) — Navy officials call the replacement of Ohio-class submarines home-ported at Naval Submarine Base Kings Bay and at the Pacific base in Bangor, Wash., the service's "top priority program." And if it means scrapping air and land nuclear weapon delivery systems to replace the fleet, then so be it, according to a study by the Cato Institute, a public policy think tank that conducts independent, nonpartisan research on a wide range of policy issues. The study underscores what it considers the importance of the replacement fleet as a deterrent to nuclear war. The Navy's plan to build 12 of the replacement submarines, estimated to cost as much as $100 billion, will put a large dent in its shipbuilding budget. The study suggests the Pentagon may have to bend the rules to fund the program and suggests it should consider different alternatives. It suggests a simple, but potentially controversial solution. "Eliminating the other two legs of the nuclear triad -- intercontinental ballistic missiles, or ICBMs, and nuclear bombers -- would save American taxpayers around $20 billion a year," the study said. "Part of the savings could be put toward replacing the Ohio-class subs." Analysts agree the Trident submarine fleet is the most survivable leg of the nuclear triad. In fact, the submarines by themselves are a more powerful nuclear war deterrent than any possessed by nearly every other nation. "Russia retains a relatively large arsenal, but no other country is capable of deploying more than a few hundred nuclear warheads," according to the study. "A single Ohio-class submarine can carry up to 192." The Navy's 14 Ohio-class submarines are capable of carrying 24 nuclear ballistic missiles and each missile can carry up to six warheads. The D-5 missile has a range of about 7,000 miles, allowing it to strike anywhere on the planet within 30 minutes. The missiles are believed to be as accurate as land-based ICBMs and are "far superior as a delivery vehicle than bomber aircraft," the study said. "Given their stealth and survivability, SSBNs represent a secure second-strike force on their own," the study said. "No other state now threatens America's SSBN fleet." The institute has an answer for those who believe all three delivery systems are necessary. "The reliance on three nuclear delivery systems is a relic of Cold War bureaucratic politics, not the product of strategic calculation," the study said. "A submarine-based monad is more than sufficient for America's deterrence needs, and would be considerably less expensive to modernize and maintain than the current force. The Navy would not have to skirt the law in a desperate bid to shake additional money from American taxpayers if the Obama administration shed its attachment to the nuclear triad." Sheila McNeill, president of the Camden Partnership and former national president of the Navy League, said she is aware of the study but cannot comment. She said other military officials will also decline comment. But she said the issue will be discussed sometime in the near future. "We are working on a conference that will educate our leadership on each leg of the triad," she said. What Have Nuclear Weapons Done for ME Lately?